So I decided that the baby room should be next on our list. We decided that the nursery will be the room closest to our room, the first room down the hall. The room currently has 2 walls painted navy blue and 2 builders beige/off white. Currently the upstairs bedrooms are carpeted. I want to update the room without starting totally over, so I’m thinking the navy can stay. 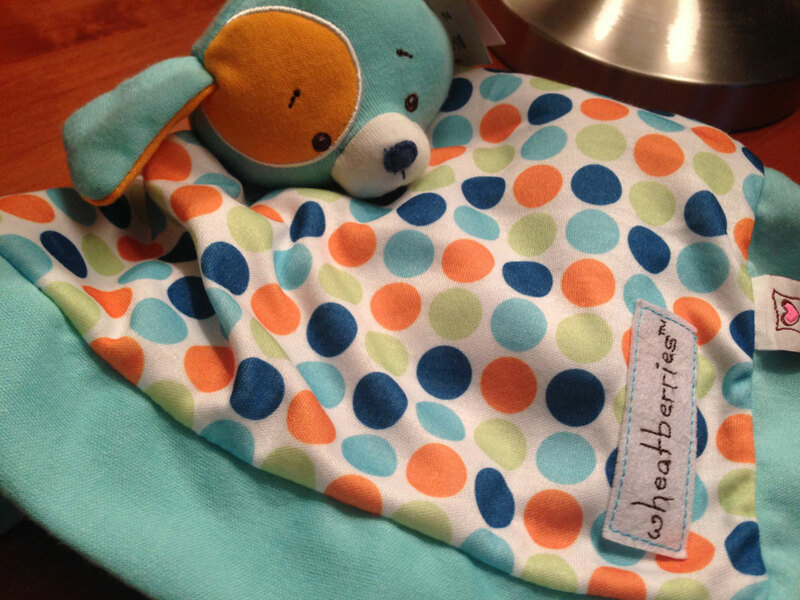 This cute dog blanket is the first baby related item we have received so I thought it was good place to start. And since we haven’t found out if it’s a boy or girl I think these colors could work for either small human. 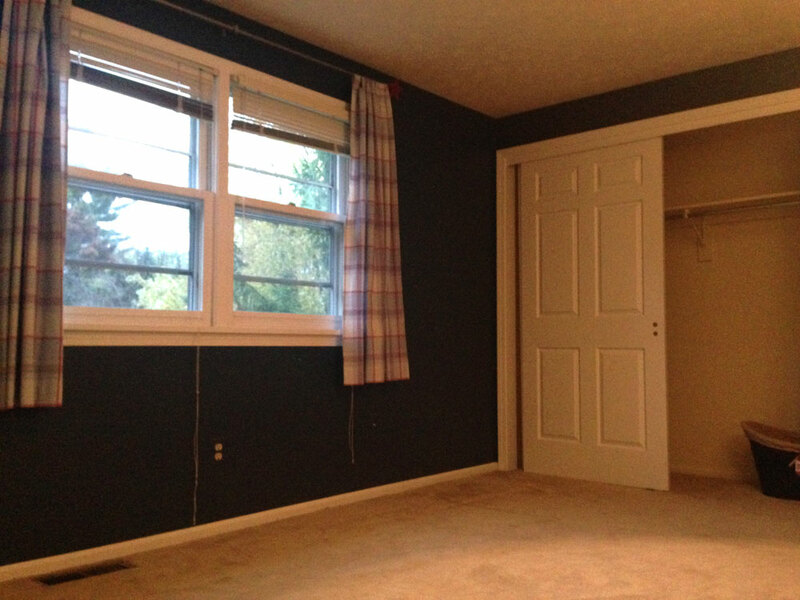 I want to paint 1 wall an accent color – I was thinking green or orange. Now (as you can see in the photos above) I’m leaning orange. I think this will help balance out the room. The last wall I am picking a light neutral – I don’t think I want to do 2 bright orange walls. But I want to refresh what’s on there since I don’t think it has been painted since, say, 1988. 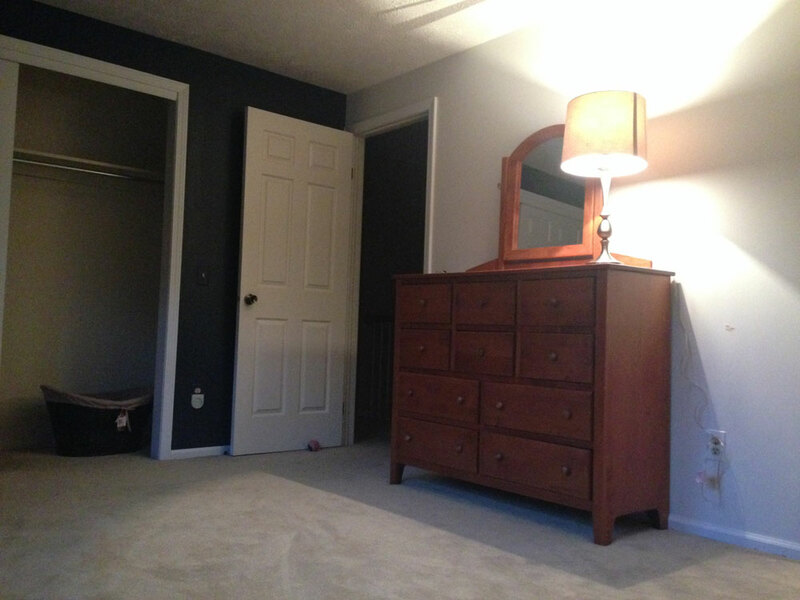 We received this dresser from the in-laws (they found it at a garage sale) and I love the drawers and size of it – so this piece will stay (possibly without the attached mirror). We ended up ripping up the carpet previous to painting. We have hardwood under all the carpeting throughout the house. We were glad to see that the floor looked good when it came up! We were ended up ordering Flor carpet squares for the nursery – we haven’t un-boxed them yet – but super excited to see how it will come together. I’ll definitely include this in a later post. I also hope to get a closet organizer of some sort so baby clothes and someday other clothes can fit and utilize the closet space better. I want to get a long horizontal bookcase – or those storage cubes – to go under the double windows. I think it could hold books, toys and store other random things. 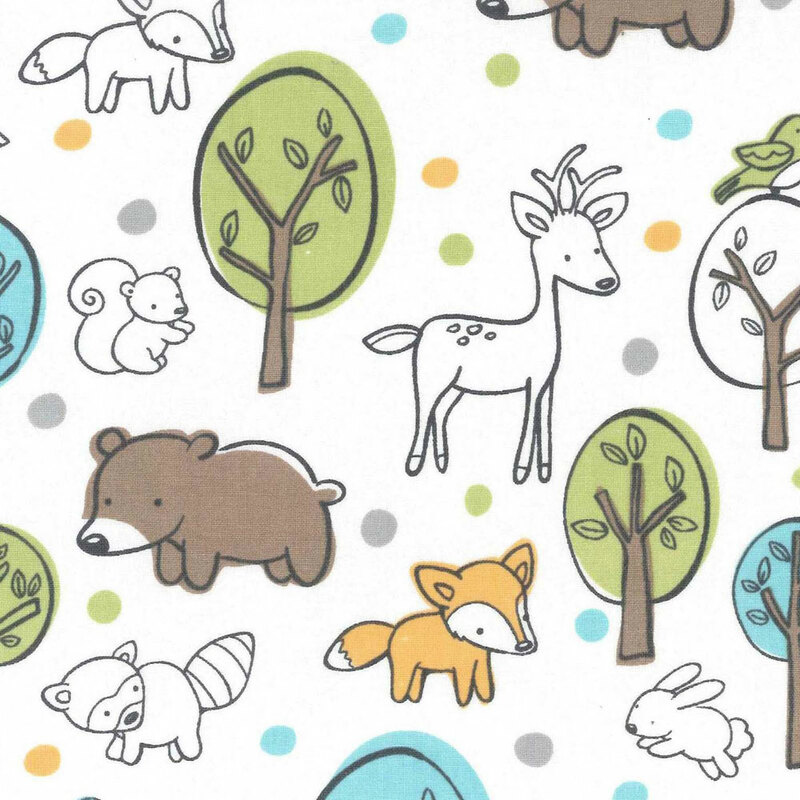 We picked out a fabric to make curtains with. My mother-in-law, Susan, was kind enough to take the fabric home to cut and get them started. A future visit might be a craft day of us finishing them up. But look at how cute these animals are! We have started to hop on all this! This ball has begun rolling (paint rolling – and in general (tee hee)) over here and I should have some more updated progress shots soon! 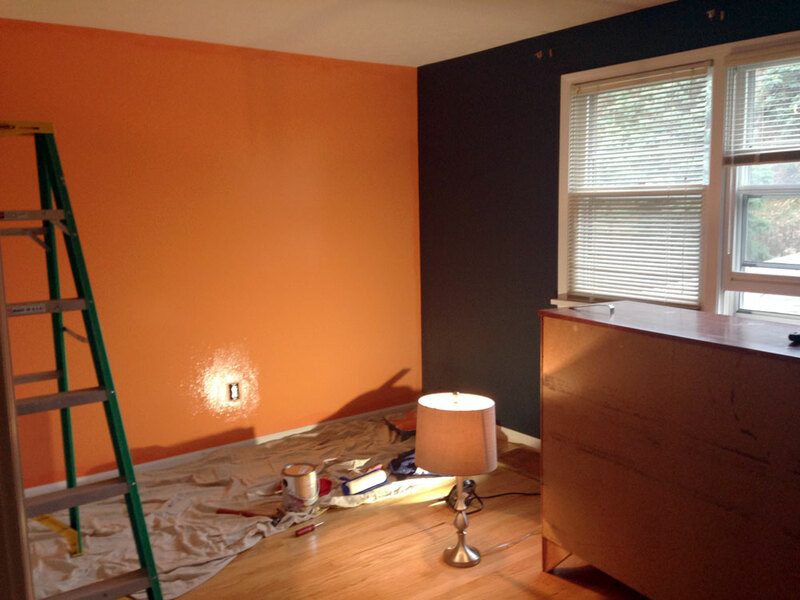 We ended up picking an Orange (Pantone’s Nectarine) and a Pale Grey (Valspar’s Gravity). Once again utilizing the Gift Card that keeps on giving. We still have painting to finish up. And after the walls are done we then get to go back and do my favorite (read with sarcasm) – the trim. 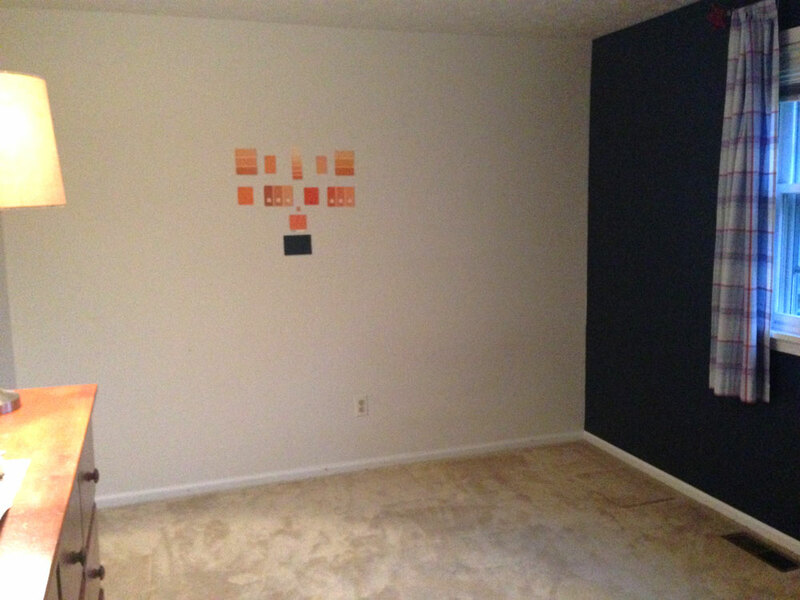 It was clearly last painted when the carpet was installed – so there is a distinct line from where that was. That will be a blast! I want to end this with a mini video clip of the one that we are doing this for. Earlier this week we got to see this on the screen. Pretty neat.